Time is the currency of today’s Experience Economy. Consumers can get anything they want over the internet; they no longer need to visit physical stores to satisfy their material needs.Increasingly, the sole reason for going to a store is the experience: because consumers actually value the time they spend in the store and view it as time well spent. And there’s only one absolutely foolproof way to know that customers view an experience as time well spent: they’re willing to pay for it. For stores, this means charging a membership or an admission fee for the experience. That may sound crazy, but consumers would never go to a movie or a play, a concert or a sporting event, a museum or a theme park, and not expect to pay admission.Why? Because you view each of these as experiences! They are engaging. They are memorable. They are inherently personal. And they are revealed over a duration of time. It is again the time you spend in these places that you value, that makes the experience worth the admission fee. But what’s happened in the shift from the Service Economy to the Experience Economy is that so many companies give away the next level of value in order to better sell what they have today. So theme restaurants create a wonderfully immersive environment but only charge for the meals. Many retailers let you try out, play with and experience the products in their stores, but only charge for the merchandise. Even Starbucks — one of my favorite experience businesses that perfectly exemplifies the Progression of Economic Value from commodities (coffee beans) to goods (packaged coffee) to services (vended or brewed coffee) to experiences (custom-made coffee in a welcoming environment) — still only charges for the coffee, not the time people spend in it's coffee-drinking locations. One café who recognizes that customers truly value the time spend in their establishment. Ah, but there is at least one café that recognizes that customers truly value the time spend in their establishment. It’s a small chain in the United Kingdom called Ziferblat Café (ziferblat being the Russian word for “wall clock”). Here, you sign in when you enter and pay six pence per minute for the time you spend there — and the coffee is free! Sure, you’re not going to get a tall, half-sweet caramel macchiato (or whatever your favorite drink is), but you are going to get a place to call your own for however long you want to stay, with books, magazines and newspapers, free internet and some rather sociable people to chat with, if you so choose. Could a fashion retailer apply this principle of explicitly charging for the experience? But could a fashion retailer apply this principle of explicitly charging for the experience? Absolutely, and the perfect example is a men’s store in San Francisco called Wingtip. Beginning as a self-funded website in 2004 that Ami Arad and a co-founder called “Solutions for the Modern Gentleman,” the company grew online sales over the next four years until they finally had enough money to open a small store (just 1,300 square feet) in the Financial District of San Francisco. That was such a success that Arad could afford what turned out to be the perfect spot for a full-sized store (6,000 square feet) in the original Bank of Italy building on Montgomery Street, across from the iconic Transamerica Building. The Wingtip Store today is like an arcade in London, a beautiful collection of shop-in-shops including ready-to-wear and custom clothing, accessories, cigars, wine and spirits, fly fishing gear, even a barbershop. What experience would be worth an admission fee in a men’s store? But from the very beginning, Arad had more in mind. 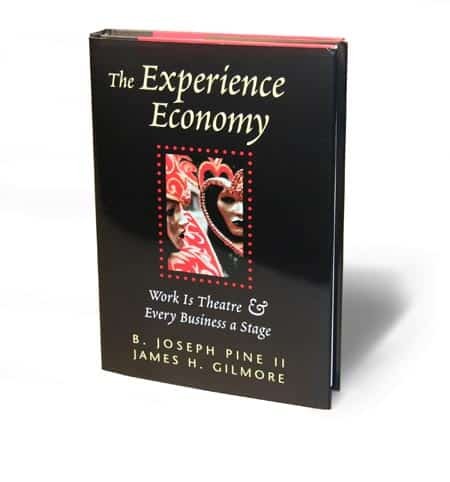 While working on the designs for the store even before the website went up, he read a number of books that would help him in his endeavors, including Why We Buy: The Science of Shopping by Paco Underhill and the book I co-wrote with James H Gilmore: The Experience Economy: Work Is Theatre & Every Business a Stage. When he got to the section in Chapter 3 titled “You Are What You Charge For,” Arad came across the question: “What would we do differently if we charged admission?”And so he asked himself that very question, trying to determine what experience would be worth an admission fee in a men’s store. His answer? A members-only club. Indeed, that’s what made the new building on Montgomery Street the perfect spot for the Wingtip Store: the availability of the top two floors (10 & 11) for the Wingtip Club. A club for which members pay for the time they spend there! Open, of course, to both men and women, the 13,000-square-foot Club is for those who, as its website attests, “appreciate the spirit of everything the store represents: the finer things in life. A custom tailored suit. A delicious glass of wine or whiskey. A hand-rolled cigar. Great food. Great company.” It has a common bar and eating area, private dining rooms, wine lockers, a golf simulator, billiards room, boardroom and roof deck. The cocktails and spirits program includes a 400-bottle whiskey collection while the wine program is overseen by a sommelier with a 2,000-bottle temperature-controlled cellar. Members that are proper oenophiles can store their own bottles in a personal wine locker for a small additional fee. While the Wingtip Store remains open to anyone, the Wingtip Club (with over 1,000 members) has three levels of membership: visiting ($1,000 initiation fee plus $25 monthly dues, for up to five visits a year for those 100 miles or more from San Francisco); social ($2,000 initiation plus $125 per month for up to six visits a quarter); and regular ($3,000 initiation plus $200 per month for unlimited access to the Club). All members receive a 10 percent discount on store merchandise and other shopping-related perks, as the Wingtip store and club work together, with the store creating demand for the club and the club creating demand for the store. You can see that Arad did not open an “admission-feed” fashion experience immediately, but worked his way there as he proved the efficacy of the Wingtip Store concept. In fact, he first prototyped the Club concept in 2010 when he took over a barbershop/bar concept that went out of business a few blocks away. When that proved a success, he only had to wait for the right space to open up for both the store and the club. He found that perfect space in the old Bank of Italy building and opened today’s Wingtip in late 2012. Similarly, other retailers may need to prototype and pilot admission-feed concepts before fully committing to them, as you want to be sure to stage an experience worth an admission fee. But recognize that if you never contemplate charging admission, then chances are you will never create and stage an experience worth an admission fee. And over time, it may not be worth coming to your stores at all. Sending the signal "This is a place worth experiencing." But if you do charge admission, then what you’re doing is sending a signal that this is a place worth experiencing. So ask yourself the same question Arad did: what would you do differently if you charged admission? NOTE: This Thoughts Post is published simultaneously on the Business of Fashion website.